A new report exposes the devastating consequences of land grabs for indigenous communities in Preah Vihear province, in northern Cambodia. The report reveals how Chinese companies, attracted by the Cambodian government to invest in local agro-industry, have been violating the fundamental rights of communities and destroying livelihoods and ecosystems over the past six years. The report is a joint collaboration between Community Network in Action (CNA), Ponlok Khmer, GRAIN, Cambodia Indigenous Youth Association (CIYA), and the Asia Indigenous Peoples Pact (AIPP). Tens of thousands of people have been affected by a 2011 land grab in the Cambodian province of Preah Vihear in which five Chinese-owned companies were granted economic land concessions (ELCs) occupying more than 40,000 hectares. The firms, all believed to be subsidiaries of a single Chinese state-owned company (Hengfu) in partnership with another (Huada), were clearly set up to circumvent Cambodian legislation that prohibits a single company from holding more than 10,000 hectares. ELCs are part of Cambodia’s efforts to transform small-scale farmer landscapes into agro-industrial ones. The government promises that this transformation will bring about development and increased profits from agriculture. In practice, however, it is achieved at great human and environmental cost, with little recognisable benefit to communities in the concession areas. This is especially true in the case of the sugarcane concessions in Preah Vihear. In exchange for destruction of local livelihoods and culture, the companies produce sugar for export, contributing nothing to food production for the province or for Cambodia. “Since they started, ELCs have facilitated the transfer of over 2.1 million hectares of land from small farmers and indigenous groups to large scale corporations and agribusiness. The arguments about the productivity and efficiency of large-scale plantations are false. The truth is that it is small farmers who feed countries like Cambodia”, said GRAIN’s Kartini Samon. Due to ELCs in Preah Vihear, families have lost the means to produce food and earn a living as the companies have converted rice fields, forests, pasture lands, and streams into sugarcane fields. Waste and harmful chemicals flow into streams communities rely on for water or to support their livelihoods. With the enclosure within the concessions of the sites of at least 19 ancient temples, Cambodia has also lost part of its cultural heritage. “Instead of stimulating development, ELCs disrupt local and indigenous livelihoods. They destroy biodiversity and natural ecosystems; they hinder priceless culture, harmonisation and solidarity among the local and indigenous people. It is painfully evident to me that sustainable development supposedly brought by ELCs is nothing more than rhetoric”, stated Ang Cheatlom, Executive Director of Ponlok Khmer. Through the years, affected communities in Preah Vihear have engaged in sustained resistance to the destruction of their livelihoods and culture, and exposed land grabs for what they really are: violent, devastating, and unlawful. They have called for the concessions to be cancelled and the land returned to them since the arrival of the companies. So far, they have managed to slow but not stop the onslaught from the concessions. But they have not given up. “We call for immediate attention of the Government of the People’s Republic of China, through its Embassy in Cambodia, on the ongoing violations of the Guidelines for Environmental Protection in Foreign Investment and Cooperation of the People’s Republic of China by two Chinese companies in their sugarcane concessions in Preah Vihear province, in Cambodia. These companies violate the international and national legal frameworks which promote and protect the rights to land, territories, economy, culture, tradition, and natural resources of indigenous peoples. 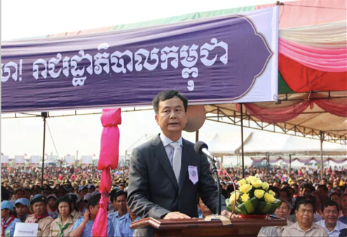 On the other hand, we strongly demand the Royal Government of Cambodia to return the land back to the indigenous communities”, said Samin Ngach, president of CIYA. “It is high time that the Cambodian government addresses the demands of the communities, including with respect to the United Nations Declaration on the Rights of Indigenous Peoples. The Chinese government and the companies and their investors should also take the necessary steps to protect the rights of and provide remedy to the communities as the ELCs infringe their responsibilities to respect human rights as per the United Nations Guiding Principles on Business and Human Rights,” said Gam A. Shimray, Secretary General of AIPP.